Titian first met Philip (1527-1598), the son of Charles V and the most important patron of his later career, in 1548 in Milan and then again during his second trip to Augsburg in 1550-51. 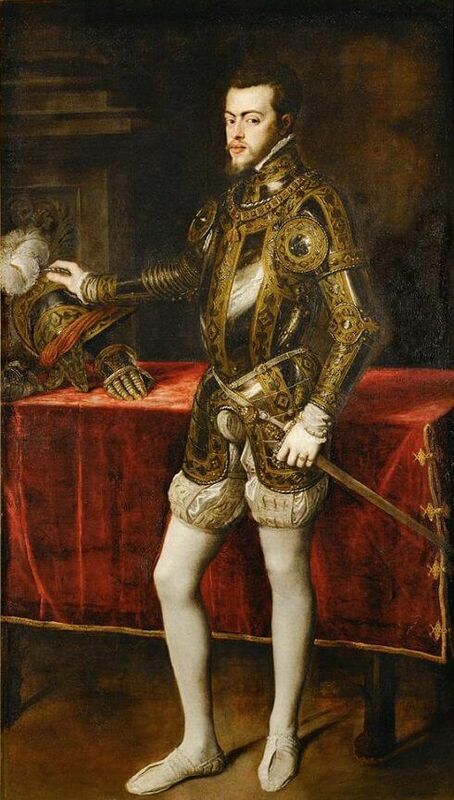 There he painted this full-length portrait of the future king of Spain in armor. The format of the image repeats the type of state portrait that Titian had earlier adapted in his version of Charles V with a Hound, but here he adds to the official status of the full-length composition a certain air of pose and gesture that somehow undercuts - if it does not quite humanize - the hauteur of the subject. Standing rather stiffly in his richly ornate ceremonial armor, one hand resting upon the helmet on the table and poignantly juxtaposed to the empty gauntlet below, Philip does not quite dominate his surroundings with the same imperial confidence as his father does in the earlier portrait; indeed, the sheer amount of space around the figure and the slightly skewed position of the table deny him full control over his ambience. The column at the left, symbol of fortitude or heroic virtue, contributes a stabilizing element to the composition that is, in fact, absolutely essential to strengthen and ground its otherwise subtly precarious balance. The painting itself offers a masterly demonstration of Titian's art. The rendering of shining armor had long been a favored studio topic for the display of painterly virtuosity, and here Titian makes the most of the opportunity presented by Philip's gold-damascened outfit. Moving with utmost assurance, varying its speed, touch, and thickness of paint, Titian's brush establishes patterns and relationships equivalent to the brilliance of the surfaces imitated; working up from the toned ground, through thinly painted cloth, to the rich impasto of highlights, it suggests the various substances of velvet, steel, and flesh. From within this pictorial exuberance, however, the pale face of Philip peers out, modeled in grays and blues with warmer touches of red reserved only for the full lips and cheeks, its pallor in revealing contrast to the surrounding richness.